Identification: Orange above with markings of fine black lines. 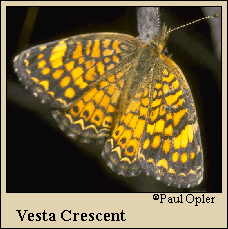 Below, forewing has a series of postmedian and submarginal orange circles on a dark background. Life history: Males patrol for females all day in low areas. Females lay eggs in clumps on leaves of host plant; caterpillars eat leaves. Flight: Many broods from April-September in the north, February-December in South Texas, all year in Mexico. Caterpillar hosts: Hairy tubetongue (Siphonoglossa pilosella) in the acanthus family. Habitat: Thorn and mesquite woodlands, desert, prairie, road edges, dry streambeds. Range: Guatemala north through Mexico to southeast Arizona and central Texas. Temporary colonist to Arkansas, Colorado, and Nebraska.